Salute! Prost! Cheers! Know a classy lady? Got a friend with style and class? This glamorous birthday card is for her. 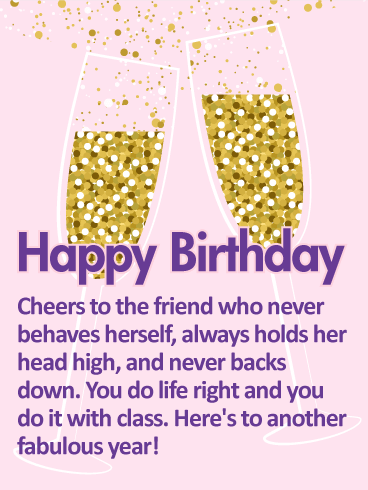 Raise your glass and toast the health and happiness of your friend with this chic birthday greeting card. For the friend who lives on the wild side, but does it with grace, this is the perfect birthday card. Help your friend enjoy her birthday by sending her a fun birthday message to start her day off right! Happy Birthday - Cheers to the friend who never behaves herself, always holds her head high, and never backs down. You do life right and you do it with class. Here's to another fabulous year! "Aww!" 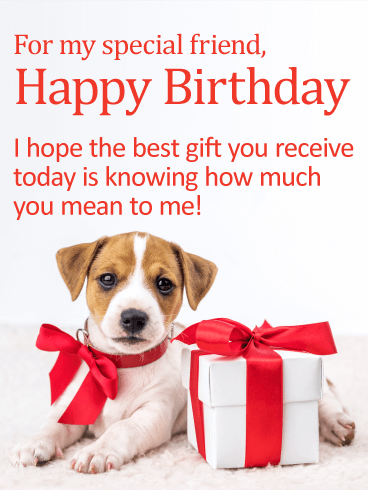 This cute puppy is all decked out in a big red bow and posed next to a special present for your special friend on their birthday! Could there be a cuter way to remind them how much their friendship means to you each and every day? Whether they're young or old, they'll surely appreciate this sweet sentiment! Nothing says happy birthday like bright colors and an exciting birthday card. 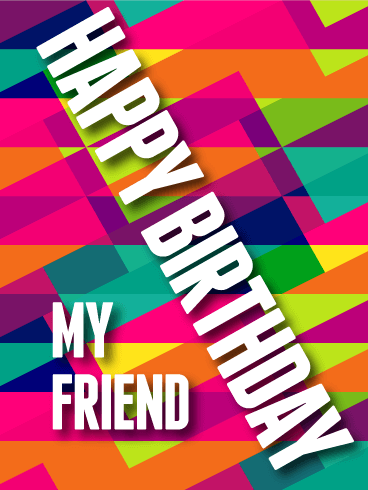 The fun geometric shapes and variety of colors make this birthday card stand out from all the others. 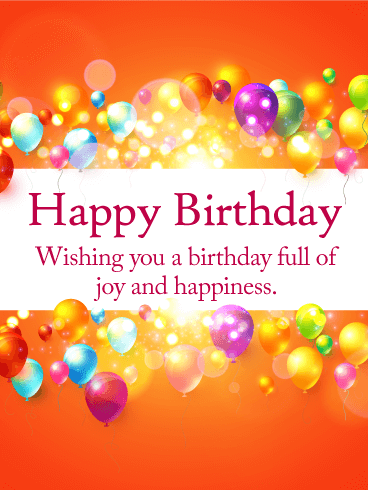 It's vague enough to be used for any friend-from a colleague to a childhood friend-and can be customized for the individual to whom you're sending the birthday card. Life is up and it's down, but it's always a great time! 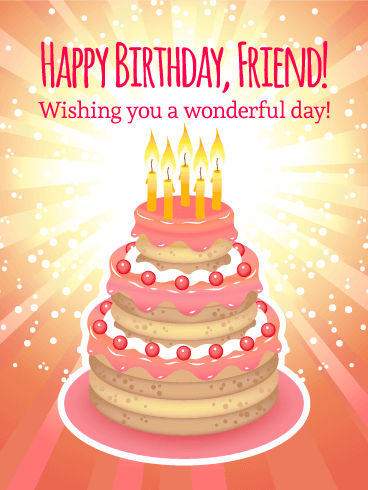 Celebrate your friend's birthday with this awesome birthday greeting card. Remind them to make it a great year-just like they always do, and to pour their heart into every precious moment. Life is crazy, amazing, and always wonderful. Wish a very happy birthday to a great friend today. 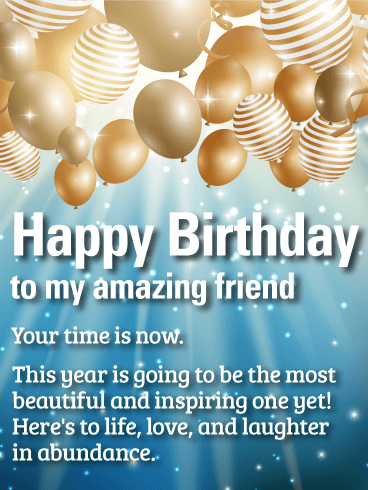 Send a festive and heartfelt birthday card to celebrate your friend's birthday. Another fabulous year and another fabulous birthday card! 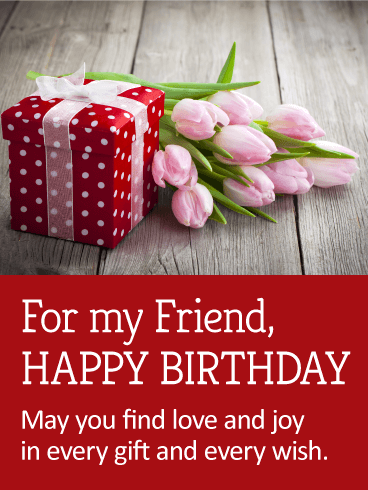 Send your dear friend an elegant and modern birthday greeting card with an incredibly thoughtful message. 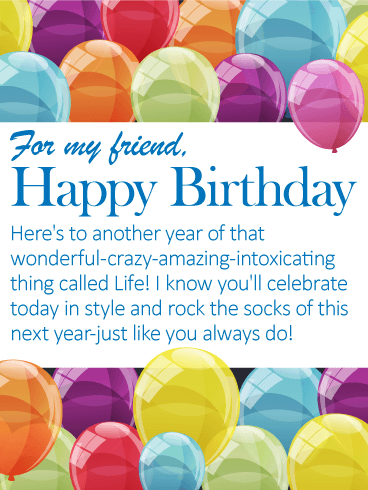 Wish a fabulous year to a lovely friend with this stellar birthday card. Say what you want to say with flair! Our stylish birthday cards are one-of-a-kind. You're sure to find the perfect birthday message for your friend. Need a great birthday card for a great friend? Here it is! 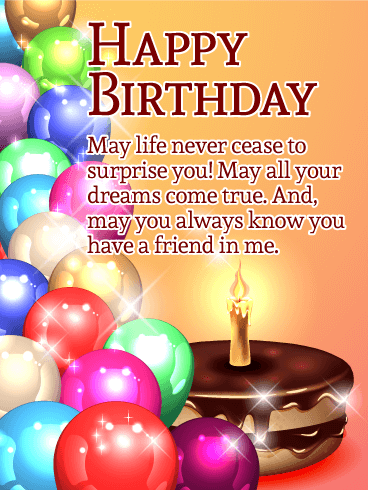 Wish your friend a wonderful birthday and send this dazzling birthday card. A delicious strawberry cream birthday cake takes center stage with this scrumptious and fun birthday greeting card. 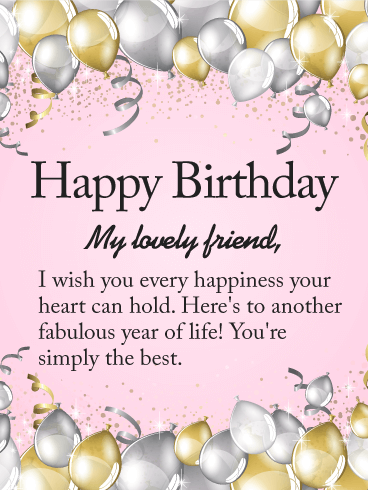 Your friend's birthday is a great occasion to wish them the best day and a great year. This simple and festive birthday card is just right for either a close friend or an acquaintance. Party balloons and streamers make birthdays epic. Your friend makes life epic! 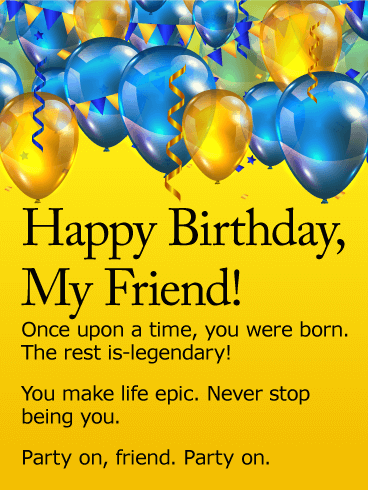 Don't let your friend's birthday pass you by without sending an awesome birthday card to celebrate their day. Celebrate your friend's life and send a birthday card that's funny and hip. 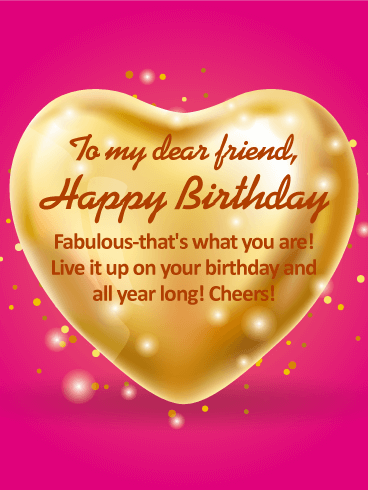 It's easy to send your friend a birthday greeting card and say exactly what you want with our online collection of excellent birthday cards! For a fabulous friend and an amazing woman, this birthday card says it all. Time to live it up and make the most of life today and every day! Send this glitzy and glamorous birthday card for a stunning friend who you want to make feel like a million bucks. A good friend is one in a million. Make sure your friend feels fabulous on her birthday with this hot pink and gold luxe birthday card. This charming and feminine birthday card for your friend features a playful polka dot gift box, beautifully wrapped with a bow and placed next to a sweet bouquet of tulips. The pretty red background below holds a special message: "May you find love and joy in every gift and every wish." It's a thoughtful and touching way to make someone you care about feel remembered on their big day. An inspirational birthday card for an amazing friend. The most precious things in life are not things. It's the friends, the family, and the connections we have that make our moments rich in love. 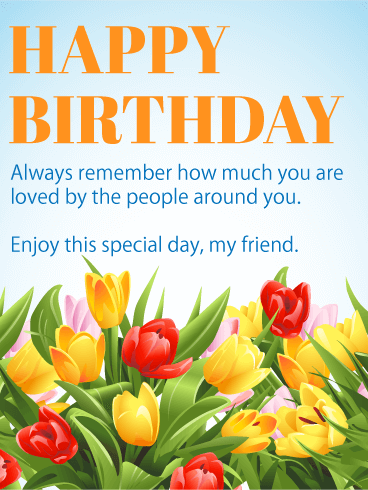 Wish your friend a happy birthday with this thoughtful birthday card. To life, to love, and to laughter all year long, this chic birthday card has the perfect message to inspire your friend to make the most of every day.